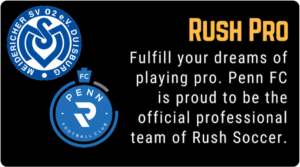 Rush members are a part of the Largest Youth Soccer Academy in the World. Rush loan possibilities extend as far as Europe, Africa, North America, Uruguay, Peru and Brazil in South America, Thailand, Tajikistan and India in Asia, New Zealand in the South Pacific and Mexico, Honduras, Haiti and the Bahamas in Central America and the islands of the Caribbean. The Player Loan Program is a Rush Soccer interclub player exchange opportunity that allows players from other Rush Soccer Branch Chapters to experience playing with other teams all over the country. Its goal is to provide numerous opportunities for our members in order to facilitate and guide their development as well as helping them to achieve their individual goals and dreams. Through the player loan program, players are able to take advantage of playing opportunities with teams in other regions of the world. Players can play in events that their team may not be able to participate in, play at higher levels of competition, be exposed to regional or national staff, travel regionally, nationally or internationally as well as experience different playing styles, coaching, cultures and traditions. If you are interested in participating in the Player Loan Program, contact our exchange rep chris.panayiotou@mysc.us or visit our LinkedIn Group. Through the Player Loan Program, Rush clubs have won the prestigious PSA and Manchester United Cup.